So the gardening bug hit me pretty hard in the last week, I’ve been pruning perennials and planting annuals and tomatoes too. I also planted something I’ve never planted before and that’s two varieties of lettuce. I don’t know why I’ve never planted lettuce before, perhaps its because I usually grab greens in the summer at the farmer’s market or grocery store but this year I began an experiment to see if I could successfully manage to grow a few heads of lettuce to make my own salad. I reused one of my old half barrels (we have a bunch) that I typically grow tomatoes in but dedicated it to lettuce and herbs this year. My local nursery sells them in six packs, so I bought the lettuce there instead of growing it from seed. I mixed in some thyme and basil too, because I can’t get enough of those for in summertime, hello caprese and pesto and fresh herbs on grilled chicken! 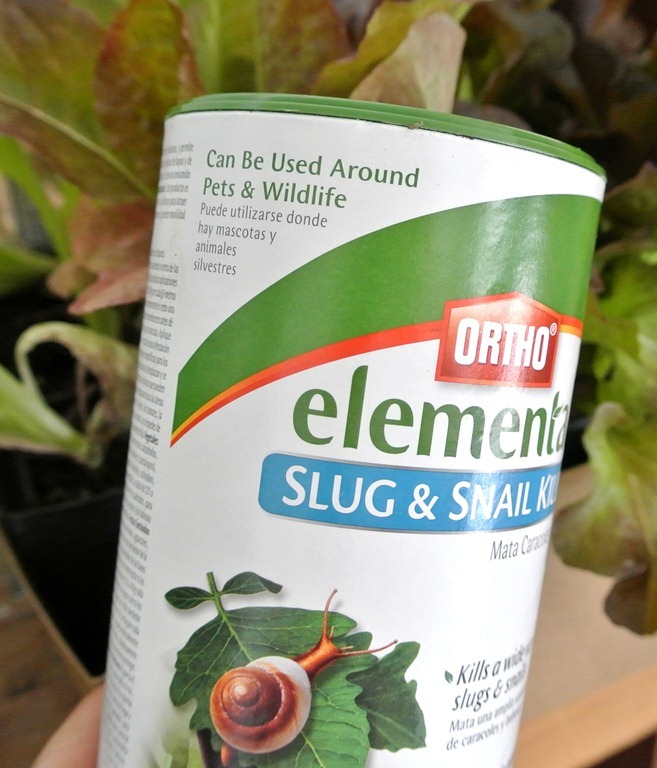 To keep slimy garden pests away from those baby lettuces, I sprinkled around the barrel a pet safe formula to avoid any garden snails gobbling my greens. And that’s the beginning of my mini tiered lettuce and herb garden, here’s hoping I can get a few salads from my efforts! So lettuce growers, share some tips if you’ve got ‘em! Anything I should know? As for all of you who’ve done some gardening yourselves, it’s time to show off what you’ve planted or created this growing season. Link up your garden related projects! that looks amazing, and i wish i’d thought of it. is there anything that comes in a can like that that will keep away squirrels? they destroy everything in my garden and pull up all my bulbs! thanks for hosting this, excited to see some more inspiring ideas! that looks fantastic, Kate! Thanks for hosting this…just what I need to get my bootie in gear outside! I’d love to try growing lettuce sometime but it’s gets so hot here, I’m not sure it would survive. Thank you for hosting. I’m looking forward to seeing everyone’s posts! tips for lettuce- place in a cool location and don’t even bother trying in the heat of summer. Early spring and then again in the fall. I found growing them in clementine or wine boxes allowed me to move them to a shady spot to survive heat. Good luck! Soo cute! And I love the whimsical birdhouse! I can’t wait to see how it all fares as summer progresses! Thanks for hosting! Love your little garden! Thanks for hosting a fun link party! I love your barrel planter. So much cuter than typical planters. I hope your lettuce crop turns out well. the barrels look great! lettuce gets tall and pretty fat, doesn’t look like you left it enough room. it will probably overshadow the herbs next to it. but good luck! Very nice! I started lettuce from seed and bought some as plants. The Romaine lettuce we grew from seeds is growing extremely well and we’ve already made several salads with it. 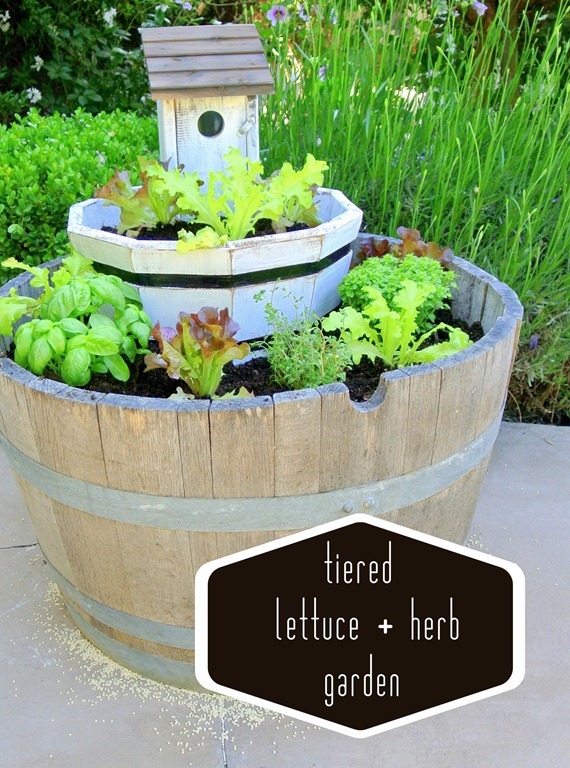 Your barrel planter is going to look so gorgeous when it all fills out! Thanks for hosting. 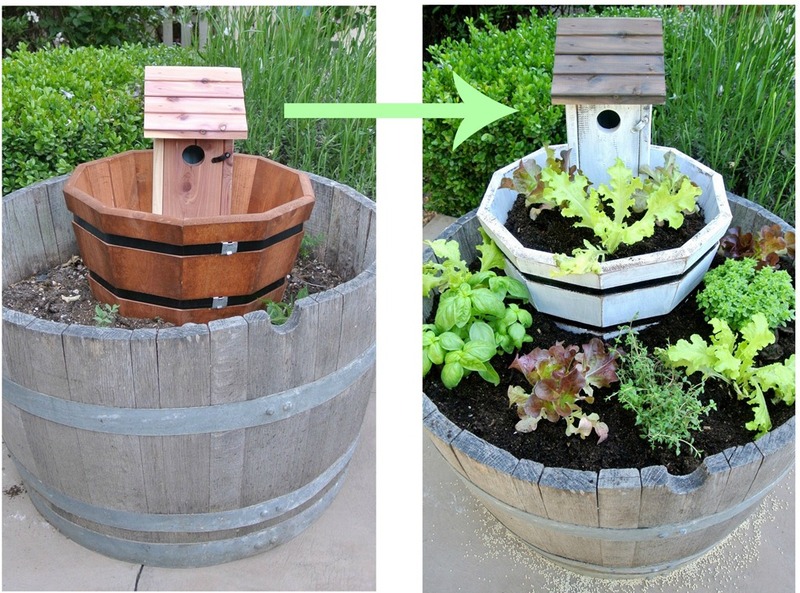 Your lettuce garden looks as lovely as it is functional! What a great variety of greens you have planted! I love the birdhouse on the top tier. Thanks for hosting…so many great gardening ideas from everyone! LOVE THIS!!!! Thanks Kate for the constant inspiration! Thanks for hosting! Your veggies look great! I think the birdhouse adds the perfect finishing touch, too! ooh kate i love this! 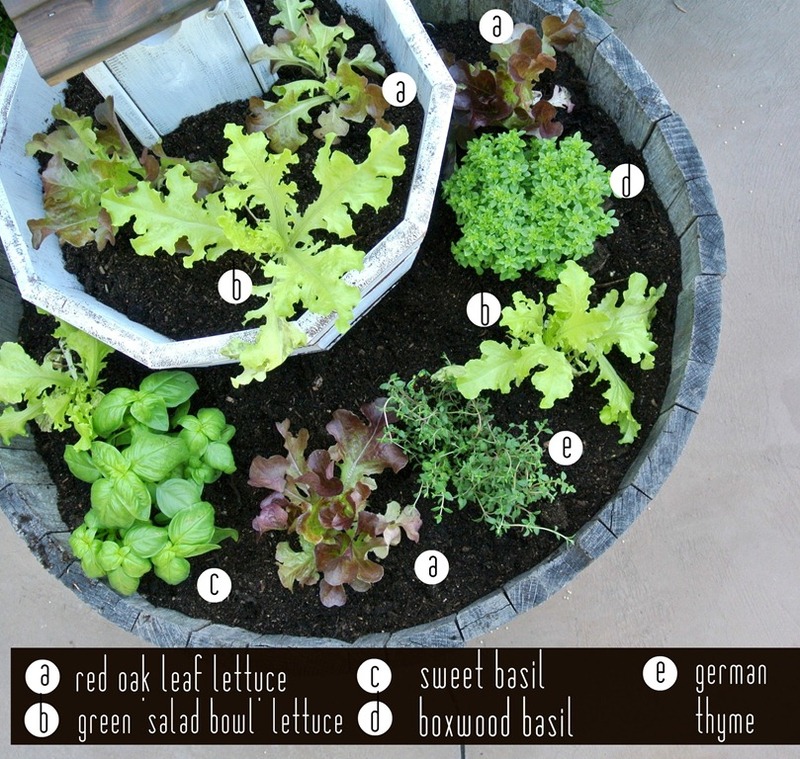 i love fresh lettuce, too- this is a great idea and use of space! you are making me hungry…. at least it is for hettlhy stuff! Great idea Kate! I have been thinking of bagging the big garden this year but I still want to grow a few of our favorites. This inspires me. Thanks, the bird house is a nice touch as well! Love this idea! Just one question: can you plant herbs among other vegetable plants? I had heard that herbs had to be separate due to their strong flavor migrating to the other plants. Does anyone know for sure? Cute party…love all this inspiration! Love your project too Kate. Thanks for hosting. Kate, I’ve been bit by the gardening bug too! Thanks for hosting! It’s so hard to blog when all I want to do is stay outside with my hands in the dirt! Love your tiered whisky barrel. It looks great. Love the barrell idea. I have grown some romaine and bibb lettuce along with spinach from seed this year, but am afraid the early heat is going to wreck them. I started them in a greenhouse in Feb and transplanted them to raised beds in April. The barrell idea would be great on a covered patio or deck for hotter areas! Thanks for sharing. Lettuce tip for you – when you need lettuce, pick a few leaves from each plant instead of picking the entire head of lettuce. This way the plant will continue to grow & produce more lettuce for you. The lettuce will like the partial shade from the umbrella but basil might need a bit more sun, ideally. Cute idea. Enjoy your crops! Kate, lettuce like a lot of water otherwise they will turn bitter, so don’t let the barrels dry out. You amaze me how u keep using barrels to beautify indoor and our (didn’t u use it as your xmas stand this year??!!!). THANKS for hosting this link parteeee … i’ve missed several so I was glad I could ‘attend’ yours and bring some ‘thyme’ (<–what my post was about haha). Very cute idea. We have been doing mesclun lettuce and leaf lettuce from seed for several years now. We plant them in two large terra cotta planters that we keep on wheels, so we can move them as needed. We speed up the germinating process by covering them with clear plastic. Once the seeds are established we put wire mesh with a rock on top to protect it from squirrels. Yes, just pick as many leaves as you need for a meal. You’ll be surprised as to how much lettuce you’ll get. We bought very little lettuce last summer once our crop took off. Lettuce prefers cooler weather, so here in the midwest, I plant in the early spring and expect my crop to continue if I’m lucky into mid-July. We enjoy our crop so much, that this year I bought a couple of extra seed packets to plant in late summer for a fall crop. Enjoy! I love your lettuce garden in a half barrel..so well done and tasty. What a good idea to make for my patio. Kate – I love your Tiered Garden, it’s so created. I wish I’ve the time to be a little created. I love your lettuce garden! How lovely! Thank you for the opportunity to link up to your party! I can’t wait to get more garden inspiration! BHG suggests putting copper trim around boxes to keep slugs away. Thanks for hosting!! I linked up a Little Lacy Flower Pot DIY! :) Can’t wait to see some of the other link ups! I love your tower of lettuce and herbs–very pretty! Smart of you to use a slug killer on the lettuce and basil–they tend to get devoured in my garden if they are not protected from slugs. I’ve grown lettuce and other salad greens in containers. I would say to make sure they are watered regularly, and to feed them regularly–weekly or so– with a complete organic fertilizer, and you should do great. With the lettuce, you can pick the large outer leaves and leave the center ones to continue growing, or you can cut the entire plant off, leaving 1-2 inches at the base, and it will grow back from there. Cutting it off will not be the most attractive option for the display in the containers, however. Best of luck with this project! How does boxwood basil taste? I’ve only ever used sweet basil? I’ll have to try it. Great little garden! Looks great! Love the little bird house. I know you strive for aesthetics…but does anyone else think it unwise to paint that barrel with water soluble paint on a container where you are growing food??? Won’t it begin to wash away and be absorbed by the food??? Hi! Nice to find you. THis is the first link party Ive joined, and I flunked my first 2 entries by not naming my link, just putting our blog name! I’ll learn. The garden ideas are lovely. Thanks for hosting, there are a lot of great ideas here! Great way to start off the growing season! I love seeing all the creative ideas! Thanks for pulling it all together! This is freaking adorable! What a great use for ‘less than great’ items. You made them look fierce!